Taken in 1976 in Chabahar port, Baluchestan, previously published as the cover of Zendegi [Life] (1981), then in Gozar [Transition] (first edition, 2007), and finally in Gozaresh-e Yek Zendegi [Report of a Life] (2015). How Did You Spend Your New Year Holidays? I don’t think any of my compatriots who have lived as long as me has forgotten the topics they gave us for our composition papers through the years after the Nowruz holidays; in addition to “Which one is Better: Knowledge or Wealth?” and “Describe the Season (especially spring),” there was the topic of this note. I’ve just come back from a two-week trip for the New Year holidays and I realize I have so much to say that I am lost about what to say, and this despite that I couldn’t even write two lines back when I was in school, that was how bad my writing was. I do not remember a time when I went to the front of the classroom to read my paper and was not ridiculed! Besides discipline, for which I often got a bad grade (once I even got a zero), I always got a failing grade in writing and composition. And all this even though I wasn’t generally a bad student, actually often among the top, sometimes even the top one. Anyway, the sixth year of high school, I failed due to family issues. That year we had national exams and our tests had been sent for grading to Boroujerd, the competitor town! And there the exams had been corrected with much more diligence. It was 1961 or 62. Only one person passed, and that one person was not me. Out of a hundred, which was the passing grade, I had gotten ninety-eight, and the bastards had not shown any leniency with the two points I was short! That was the first real failure of my life. I was deeply saddened and hurt; and I felt ashamed to face my family. They had anticipated my diploma for a long time. A diploma meant a job and a job meant income, which was something the family badly needed, and I had disappointed them . . . I remember that summer I decided to make it up to them. I began reading, reading rigorously . . . But not school texts! Rather Hafez, Sa’di, Naser Khosrow’s travelogue, and [Foroughi’s] Trajectory of Philosophy in the West . . . Seemingly, sometimes in order to find your way, you need to go off road. To solve an issue you are dealing with, you have to solve another issue first. It is as if to find ourselves, we are sometimes in need of failure . . . Anyhow, now that I am writing this note, of all the Hafez I have read I only remember الا یا ایها الساقی and فلک را سقف بشکافیم و طرحی نو در اندازیم ; of Sa’di, I only remember گل همین پنج روز و شش باشد ــ وین گلستان همیشه خوش باشد; but Naser Khosrow has been my companion all along: how I walked through cities with him to arrive at the three and a half million kilometers I’ve traveled to this day . . . and philosophy! How Plato’s Theory of Ideas seemed fresh to me, Aristotle’s Utopia provided the first sparks for idealism, his city-state run by philosophers, and Socrates who drank from the hemlock chalice to celebrate truth and keep the search for it invaluable to me; and Heraclitus whose sentence “You could not step twice into the same river” set my life in motion, and Spinoza . . . oh, how many philosophers we’ve had! The following year I graduated top of my class with a GPA of 14.6 and a composition grade even lower than those for physics and mechanics. I still do not know which aspects of what I had read helped improve my algebra, trigonometry, or mechanics . . . And fifty years later, translating Bukowski’s poetry, I realized how well I understood him when he implied that whenever he failed he had really succeeded and whenever he succeeded he had really failed. I believe that if women were put in charge, we would have a better, more humane world. I believe the world’s testosterone level is too high! That’s what my older daughter used to say. This year, my youngest decided to accompany us in our Nowruz trip, and well, this meant we had to adjust our travel plans accordingly. We didn’t intervene with her making the arrangements and everything actually turned out better than we had imagined – she had even thought about reserving hotel rooms with balconies so we could smoke. I always wish we could travel lighter. You may not believe this. Sometimes for a ten or twenty thousand-kilometer trip, I just tuck a coat, a few underwear pieces, and two or three t-shirts in a plastic bag, which I then throw in the trunk and that is that. (My wife points to the sheets and says she will take care of the rest!). But we always end up with excess baggage and this time even more than ever, the reason for which I only learnt later. On our way, we stay for two nights in Shiraz. Like the previous years, we follow the ritual of having “yogurt kabob,” the specialty of the revered Qashqai tribe, and a meal of “herbs aash” for breakfast at Bijan and Parvin’s house . . . We fill our nostrils with the scent of orange blossoms and we get on our way in company of our hosts . . . We are headed to Chabahar through Bandar Abbas, Minab, and Jask. “What grade are you in?” “First.” “Here you go! How about you?” “Third.” “This is yours!” “Fourth.” “This for you! And when you are done reading, pass it on to your friend.” Women are like this. They are mothers, they teach and they train. My wife knows about all age groups, even my age group! Books, cookies . . . Nowruz, spring, Chabahar, Baluchestan, children, people . . . and these, the only things we can do to perhaps make this nonsense life a bit more meaningful. When we were young, we wouldn’t be satisfied with less than revolution. Now we have seen revolutions too . . .
At one point we get stuck in the sand. Less than half an hour later, the village head has been informed . . . It seems that when we were getting off the road, some villagers saw us and predicted that we would soon run into trouble, and they let him know. They come and pull us out of the sand. We want to compensate. The teenagers who have come to help do not accept money. We haven’t brought enough Baluchestan books, we give them the few that we have, along with some other books. They insist on inviting us over. They offer us tea and cookies . . .
Down Jagin Dam, Bijan goes to buy watermelons from a farmer. The farmer puts two watermelons in his arms and doesn’t charge him. At a fishing site, I go buy some fish, I choose three, the fisherman wants to give me one more, I tell him just the three will do, and when I want to pay, he doesn’t accept, I insist, and of the bills I hold out, he only takes one ten thousand-toman bill and gives it to the man who has deboned the fish for us . . . I do not want to write anything about poverty. There is poverty in Baluchestan, but I don’t see any poor people. You only need to step out of Chabahar’s free zone—leave the glittery malls, step away from the middlemen—to see poverty, see shacks and their residents, see, on the outskirts of the town, a man who despite his blindness fills out your camping gas stove in exchange for a small sum. There is poverty, as much as you could imagine, and not just here, everywhere, but here there are no poor people. Poor is not the fisherman who offers you free fish from his little batch, poor is not the farmer who offers you watermelon without charging you . . . Poor are the ones who steal billions and billions and still feel in need . . .
After that horrible sickness of mine, I don’t want to know what is going on in the capital Tehran. I don’t want to know what happened after they found an excuse to remove the new mayor from office. I don’t want to know what the dollar-rial exchange rate is now. I don’t want to know what Trump’s latest tweet is . . . I don’t want to know what is going on in the world at all. I just want to walk on the beach, watch the fishermen returning from the sea, watch the endeavors of the people who take a leap into the sea for a piece of food, watch single mothers who approach the boats returning from the sea to take a share. 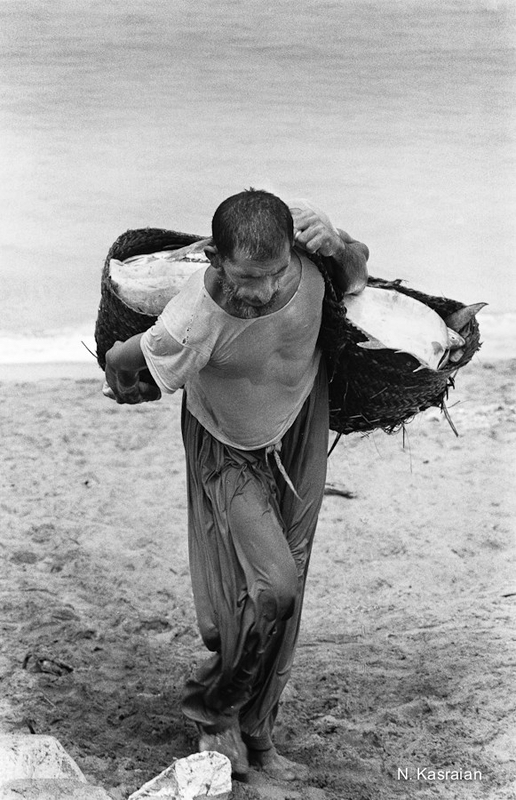 I want to witness generosity, want to see first-hand the sharing of poverty, want to see “human beings,” want to see men with muscular suntanned bodies carry the fruits of their labor to the beach with baskets woven of palm leaves, want to see the remainders of the Chabahar I saw forty or fifty years ago . . . I ask around about a café on the porch of which a little girl, whose picture I took, used to sell egg sandwiches forty years ago. The café has closed down and perhaps today the little girl is one of the women approaching the boats returning from the sea. I want to find the very secluded spot on the beach where decades ago I spent the night in my car, waiting for the sunrise to photograph the port. I want to remember, I want to remember what I once saw and I want to forget what I do not wish to see or know . . . Sometimes one wishes to consciously forget; sometimes one wishes to close his eyes; sometimes one wishes to neither see nor hear; sometimes one misses “illusions” . . . I am now in such a state. I am exhausted of bad, disheartening news . . .
“I do not remember when I heard the name of Baluchestan; a place southeast of Iran. A dry land, vast and thirsty. A window to the magical world of India. A forgotten border in which everything is ethereal. Perhaps it was with draught and famine that I came to know of it; the famine of 1964 and the forced migration of families hundreds of kilometers further to work on the vast farmlands of Turkmen Sahra. Perhaps it was with the scent of a strong spice that had turned into a memory, an unknown intoxicating scent; or with the beautiful designs of a cloth; or the traces of a female hand over a piece of clay with magical patterns. Perhaps it was with hearing a memory narrated through the lips of a petite little girl with dark complexion; the memory of an outlaw whose remembrance makes the Baluchis mad with passion; the story told by a Baluchi classmate whose large black eyes kept alive the mysterious sorrow of the far-away mountains and meadows of Baluchestan. Whatever it was, that remote edge of the world found its way to the imagination, and a journey to it became a journey to history and to the subcontinent. Referring to the poem “Looking Back,” Sifting through the Madness for the Word, the Line, the Way. The original Persian can be found here.